I just don't get it. People come out here to "enjoy" nature, take a swim, get some sun and then trash it. The local ranger should be called. 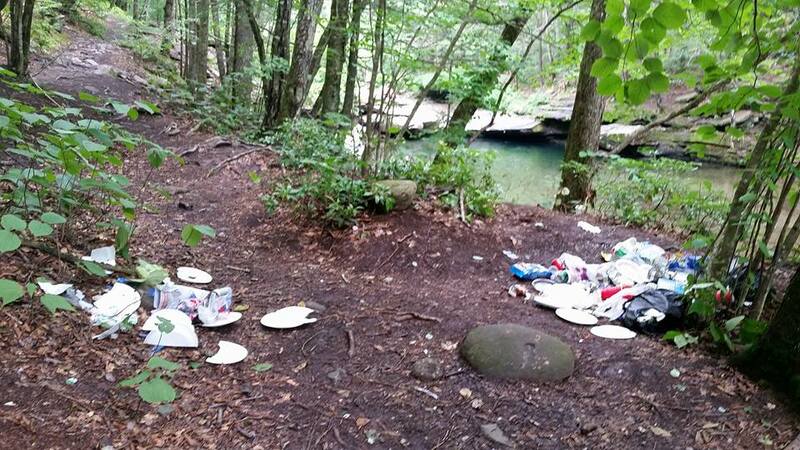 In the southern ADKs, trash was left like this at a local roadside campsite and a name was found in the trash. They were caught and ticketed. Anyone want to go thru the trash and find a name? Lots of comments on facebook too. Terrible. I always hike with an extra trash bag to pick up garbage I find along the way. That's such a shame. I think instead of hiring summit stewards, the catskills should hire watering hole stewards. Just someone wearing a uniform looking official telling people no food, pack in pack out would be useful. I mean I've never been to a summit in the Catskills that required someone to take care of it. The ones in the ADK are different because of all the vegetation that gets trampled. I see these waterfalls as the same thing. Rangers show up there often, maybe not often enough. A Steward is a good idea.